The best science fiction stories don’t focus solely on space ships and aliens. The best science fiction use those devices to talk about the human condition or the emotions that drive people to do what they do. Star Trek is a classic because it addressed its themes of prejudice and equality in a sly fashion by placing the issues in a fiction. 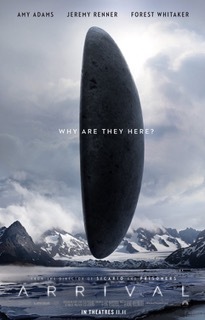 ARRIVAL on the surface is about alien craft that hover over select points around the globe and how linguist Dr. Louise Banks (Amy Adams) uses her skill to communicate with them and finally figure out their real purpose for visiting Earth. But ARRIVAL is about so much more than that. It is about loss and grief and how to return to a normal existence. Banks is divorced (or separated, it’s not clear). She has suffered a devastating loss, her daughter has died of cancer some years earlier. She is simply going about her business, teaching her classes all while trapped in a kind of funk or malaise. Then these alien pods arrive. She is so absorbed in her own drama, she barely registers what is going on. Then Forest Whitaker shows up. He is an army Colonel who has history with Banks. She’s apparently worked for him as a translator in the past. She is recruited to try to figure out a way to communicate with these aliens. Along for the ride is a physicist played by Jeremy Renner. The two must work together to save the planet and humanity. The big problem communicating with these aliens is they do not speak or communicate in anything we would recognize as a language. They use symbols which no one understands. Banks must figure out what it all means and how to say hello without inciting the aliens to blow up the planet. Her journey of discovery is fascinating. She understands that we cannot just ask them what they want. To use a tortured metaphor we have to walk before we can run. She has to do this while dealing with the military, and international politics. And she has to do it while continuing to slog through her grief. In the process of figuring all that out, she also figures out how to move past her personal tragedy. ARRIVAL plays with time in a unique way. It can be sometimes difficult to follow when it jumps around, but after a while you become used to the device. Director Denis Villeneuve (Sicario and Prisoners) does a masterful job keeping it all on point. Adams is fabulous. She plays Dr. Banks perfectly. She is brave, fearless and completely vulnerable. And if you think all three of those things cannot coexist in one character, Adams proves you wrong. This touching, earnest and tense sci-fi story is among the year’s best.